I have a few cleansers that I would like to review for you and at the moment it seems like that two upcoming posts will also be dedicated to them. So I hope you like washing your face or are in need of a new cleanser. First I want to talk about a cleanser that I've been really enjoying as a morning cleanser, and the other two I'm going to mention in upcoming posts are both oil cleanser, for removing makeup. Now let's have a chat about Earthwise Beauty and their Marshmallow Face Cleanser*. 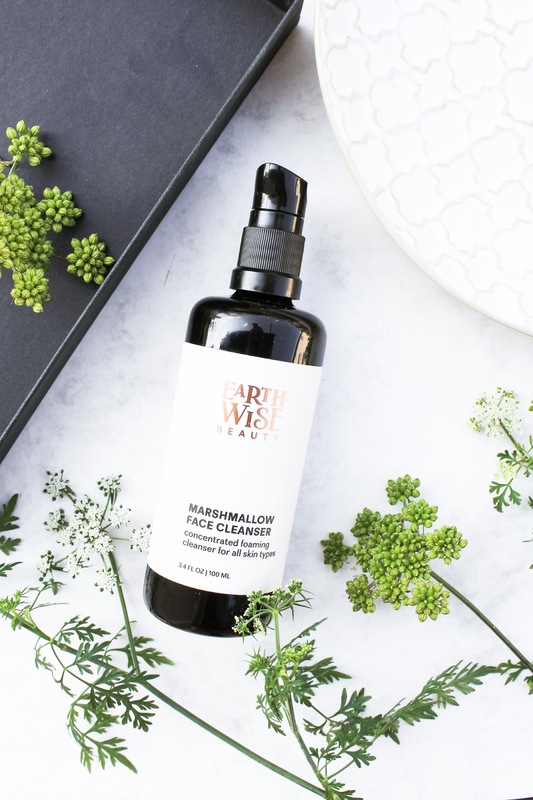 As you might know already, Earthwise Beauty went through a complete rebranding. They recently revealed their brand new packaging (see my post about it here) and since I got their products in the new packaing (see here), I love their new logo and miron violet glass packaging even more. It looks really grown up, so beautiful and chic. I love the new look and I think they did a very good job with it. They also retired some of their products (for example their Blackstrap Molasses and Frightening Green masks which I loved both so much!) but they also came up with some new product names and new products. They didn't make a big deal of their brand new launches so I will have to make a bit of a buzz when I review them. I've been really into their new Thelma Lip Treatment*, a nourishing and more of a matte lip balm which has been working really well as an overnight lip treatment. The other product is Yasuni Face Balm* which I'm kinda saving for autumn and winter. It doesn't contain any essential oils and was especially created for sensitive, oily, combination skin. 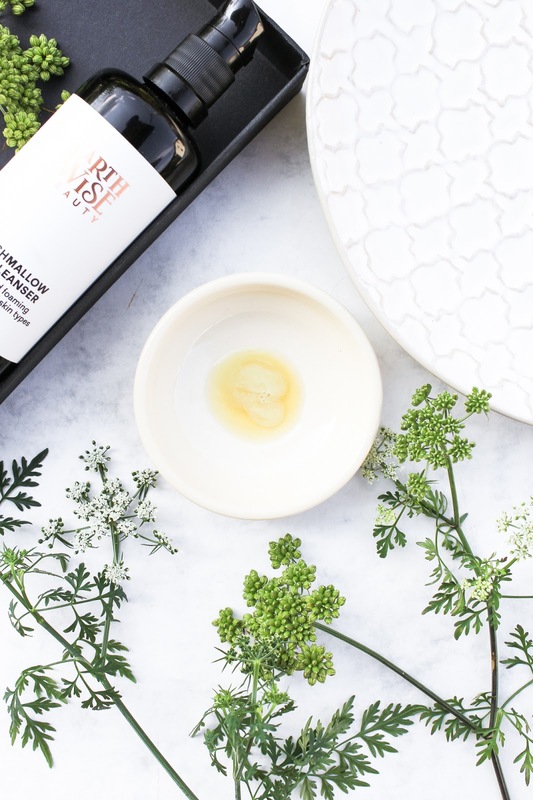 I adore their Tigress Face Balm* (read my review here) and I'm sure I will love Yasuni as well. Will keep you posted. Ok so the Marshmallow Face Cleanser is not a new EWB product but it did have a little re-formulation. I don't have the old bottle of it, only used a sample of that one actually, but as far as I know, the scent is not as strong as it was before. After trying that sample and smelling the product I wasn't really that interested in getting a full bottle of it. The scent really wasn't my fave. But with this new, reformulated bottle, I really don't mind the scent. It is lighter and softer, and not as overpowering as I feel it was before so it doesn't bother me at all. I love a beautiful scent as much as the next person but if a product works and is effective, then I really do get used to a scent quickly, even if I don't like it in the beginning. Anyway, the cleanser does contain a few nicely smelling oils like Chamomile, Blue Tansy, Lemon Balm, Violet Leaf but it smells more like Marshmallow. I think. Or is it the Galbanum oil? I'm not familiar with this "aromatic gum resin". As the EWB founder Ava said under Arjun's photo: "the scent was adjusted a little to make it greener. I added violet leaf and my beloved galbanum. 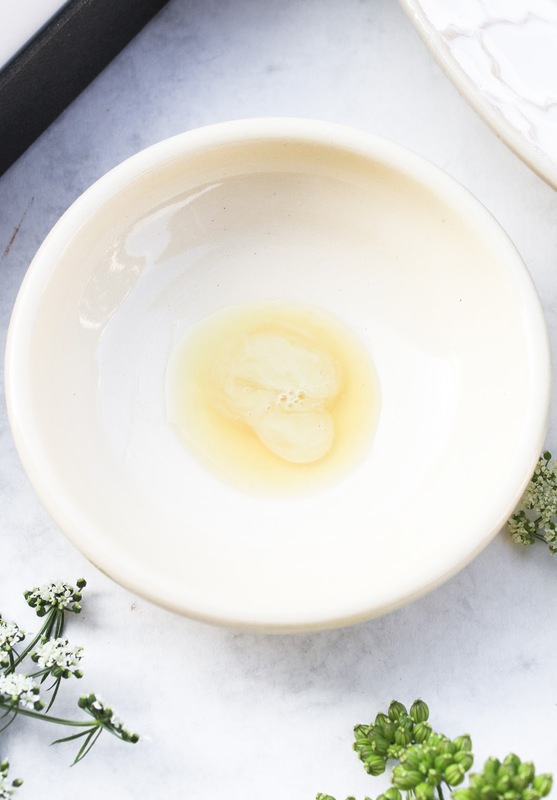 Also the pumpkin oil adds a little to the scent, it is much more fragrant than the previously used apricot kernel oil, with nutty, spicy, and sweet notes." All that being said, I don't even notice the scent anymore because it really isn't strong and also the scent to me isn't the most important thing when it comes to skincare. Marshmallow Face Cleanser (previously known as Marshmallow Suds Face Cleanser) is described as a "soothing unisex cleanser" and I couldn't agree with more. 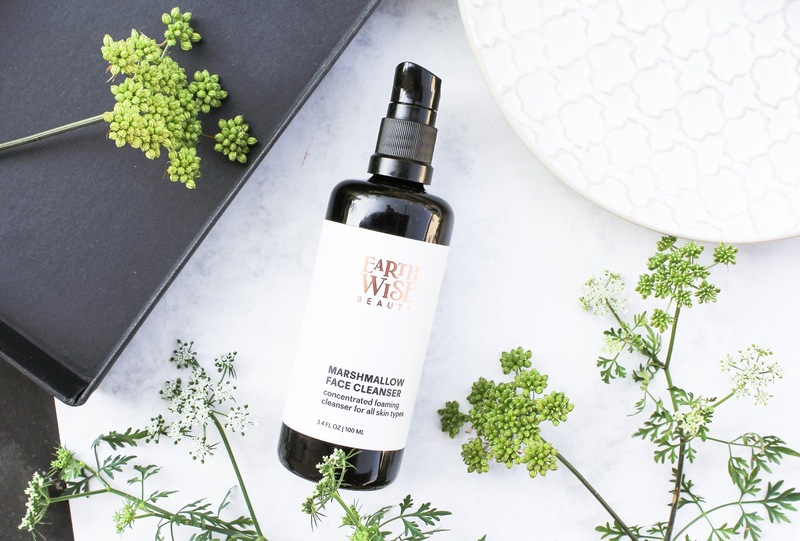 There are some gorgeous ingredients in this cleanser, like it's always the case with Earthwise Beauty products. There's a herbal infusion of Marshmallow Root, Calendula Flowers and Chamomile Buds, Coconut, Pumpkin Seed, Jojoba and Hemp Seed Oils. There's also Aloe Vera and Glycerin. I've mentioned Blue Tansy and German Blue Chamomile before and these two are super anti-inflammatory, calming, soothing, repairing. The cleanser is all that for sure. Even though they say it "will remove light to moderate makeup" I really haven't been using as my first evening cleanser. I always use an oil or balm cleanser to remove my makeup and then I often use it as a second cleanser. Sometimes I end up with a little mascara left after my first cleanse and this one beautifully removes the last few traces of it. I really like it as a second cleanser in the evenings but when it really shines is in the mornings. I don't always like to use a cleanser in the morning but there is just something about this one that I always gravitate to. Oh you Marshmallow cleanser, you sure are beautiful. Cleanser feels very concentrated so I like to shake it up before using it. A little goes a long way so two or three pumps are plenty. It's always good to shake product emulsions like this (when there are water and oil components). The product comes out as a mix of oil and lotion and it has quite a unique texture which I would would probably describe as a gel. This cleanser feels very silky, it is mildly-foaming and unlike many gel cleansers, this one isn't drying or tightening on the skin. It actually feels a little bit hydrating & softening and I love that about it so much. 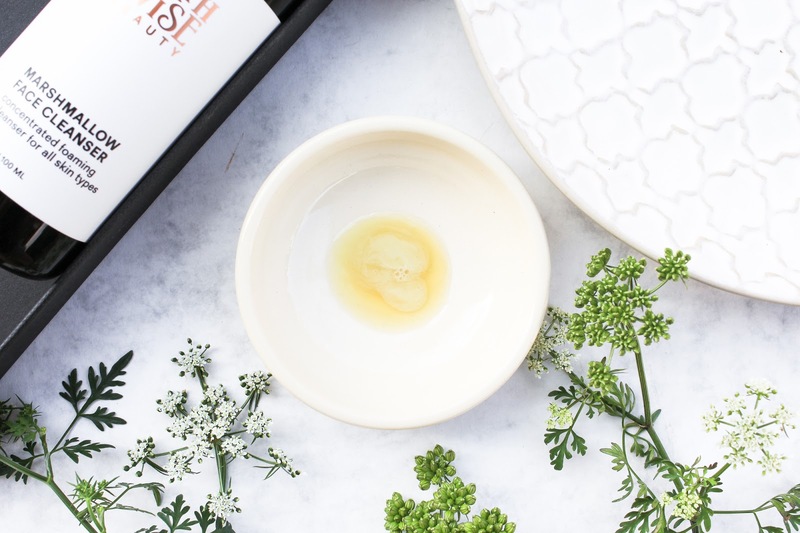 It just feels very nice on the skin and I adore that it contains soothing and calming ingredients. Marshmallow Face Cleanser is vegan, cruelty free and handcrafted. It's very gentle and is therefore recommended for all skin types, even the most sensitive skin. It doesn't clog pores and it also shouldn't aggravate acne. It can also be enjoyed as a body wash, which is especially recommended for people with sensitive or dry skin or skin prone to allergies or eczema. Marshmallow Face Cleanser is the only liquid cleanser Earthwise Beauty has and in my opinion they don't need another one because this one is stunning. It comes in this gorgeous 100 ml bottle which will really lasts you for ages (the same as Farizad's Veil SPF, read my review of it here). I fell quickly in love with it and I highly recommend it. Love. You can get the Marshmallow Face Cleanser here, where you can also use my affiliate code "Loveliness" to get 15% off your order. In Europe you can get Earthwise Beauty products at Reina Organics and Eminessences. July 30 through August 5th all orders $100 or more will include a box of their Goldenrod Tea.